The buck-topology driver ic from Cypress Semiconductor can operate at switching frequencies above 2 MHz, which means that the driver ic can fit a tiny footprint with small magnetic components. 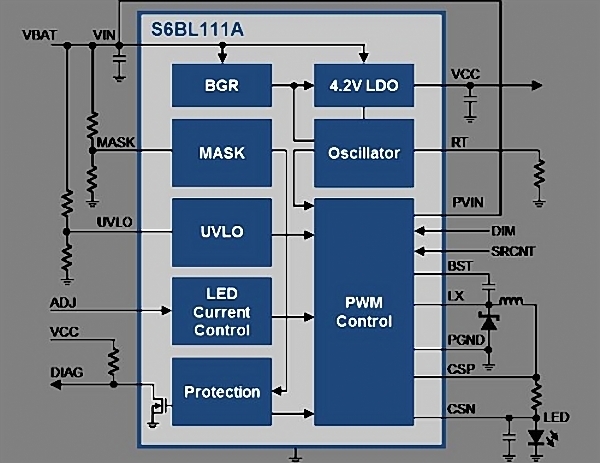 Even the specialty IC semiconductor companies will be on the show at the Consumer Electronics Show (CES) in Las Vegas, NV, and Cypress Semiconductor is using the tradeshow to announce several new ICs that target consumer products, including — surprisingly — an LED driver IC for automotive LED lights applications. The S6BL111A driver IC family targets applications in LED headlamps, daytime running lights (DRLs), LED turn lights, and LED fog lights. Cypress boasts the top switching frequency of 2.1 MHz as a key feature for the application because it allows driver ic design in a small footprint with no large inductors. There are a lot of LED driver ICs on the market that target automotive LED lights applications. For example, Texas Instruments (TI) launched an IC intended to enable LED headlamps with functionality similar to the Audi Matrix design a bit over a year back. We also recently ran a feature article on such LED driver ic designs. The Cypress solution is unique in that the IC is designed to drive a single LED at 1A with an extremely small driver foot print. The nearby photo of the company evaluation kit provides a reference for the size requirements. Developers could use a single LED from some of the targetful applications or combine multiple driver ics /LED chips pairs for applications such as complex LED headlamps. But with LED brightness keeping improving, a single LED chip can handle many of the intended tasks. The new LED driver IC is also very flexible regarding the driver ic application. It can operate over a broad input voltage range from 4.5V to 42V. Such flexibility is needed for different automotive operating conditions from cold cranking to power surges when the electrical power is turned from the battery to the alternator. Also, the LED driver IC can work over the frequency range of 205 kHz to 2.1 MHz. As mentioned previously, higher switching frequency equates to smaller components but sometimes lower frequencies can improve other performance characteristics including reducing EMI noise. The S6BL111A IC relies on a buck switching topology. It can support either analog or pulsewidth modulation (PWM) dimming. The design supports the expected system protection functions such as under-voltage, over-current, LED open detections, and thermal shutdown. Besides, the component is qualified to the AEC-Q100 Grade 1 specification required in many automotive LED lights applications.